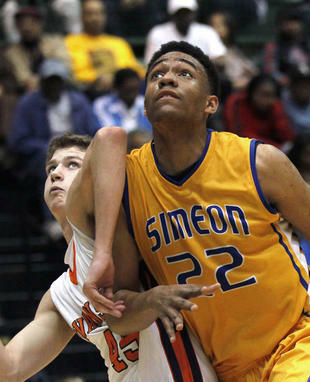 Jabari Parker is on everyone’s wish list for next fall. He is considered the best high school basketball player in the country and every team wants him. However, he has narrowed the field to just five schools: Duke, Michigan State, Florida, Stanford and Brigham Young University. Many were surprised to see BYU on the list, since it is a good school but not one of the highest ranked. However, BYU is owned by The Church of Jesus Christ of Latter-day Saints, whose members are sometimes nicknamed Mormons. Jabari Parker is a practicing, believing Mormon and he is serious when he includes the school on the list. There is an appeal to attending a school where everyone shares your standards, games aren’t played on Sundays, and you can attend religion classes right on campus. And then there are the girls. On a recent visit to a BYU game, a sign was posted in the stands that read, “BYU — 15,994 Mormon girls, Duke — 13 Mormon girls.” For a teenager, this could be a consideration, particularly for a church that encourages its members to date other members, in order to marry in the Mormon temples. There, marriages can be performed for eternity, not just a brief span of mortality, and children and parents remain a family forever. During this visit, students made an open effort to recruit Jabari themselves, anxious to have him bring his powerful skills to their school. A group of students raised money to purchase 6300 t-shirts that read, “Chicago to Provo.” These shirts were distributed to students attending the game Jabari attended. These were distributed on private property and was cleared with the NCAA and BYU to avoid any recruiting violations. Rules prohibit using his name or picture on campus during recruiting visits, which is why the shirts had neither. Of course, any school that gets him is likely to do so for just one year. After that, it is anticipated that he will either serve a Mormon mission or go into the pros. 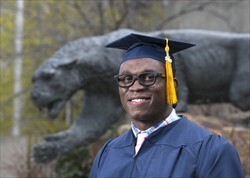 Although the Mormons recently lowered the age for male missionaries to eighteen, Jabari has already said he will follow his initial plans to attend college in 2013, although he has mentioned the possibility of serving a mission when he is nineteen, as his older brother did. Even a year could make a difference to a school in terms of statistics and recruiting power. It is anticipated that with the talent the school already has, the addition of Jabari Parker could create a winning season for the Cougars. Parker broke his foot over the summer, but managed to return to the court in time for the opening game of his final year in high school. 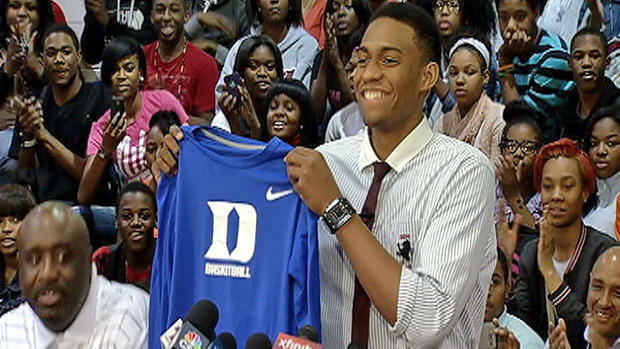 Learn more about Jabari Parker.